A few weeks ago I took a picture of the herb garden. 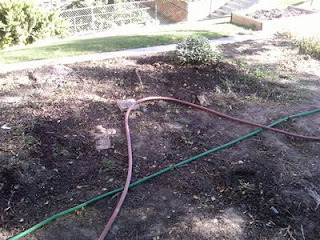 Since then we cleaned out a lot of the older herbs and weeds. I have been in contact with someone who will donate some granite. We've been playing with designs. So this is the empty herb garden. It will be fun to take photos as the herb garden evolves into something more than just dirt.